To round up the ‘Salford swimmers on international duty week’ there was National Champion Lewis Clough representing GB in Hungary. Lewis 18, a student at Eccles College was competing at one of the toughest meets in the world where some of the medal winners here could well be in Olympic finals in Rio. The European Junior Championships taking place in Hodmezovasarhely, Hungary from 6 to 10 July 2016 is enormously challenging where it can often be easier in some events to make our British Olympic Trials finals than to make finals at this competition. 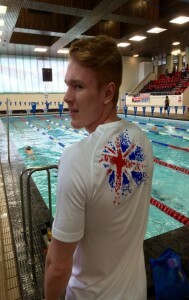 Lewis was swimming for the GB Junior Team and competed in the 50, 100, 200 Freestyle along with a further 4 Relay events. 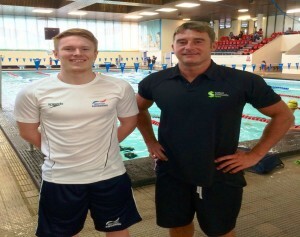 A total of 26 athletes were selected and 18 Years old Lewis can consider himself amongst an elite group of swimmers in Great Britain. It was such an honour to be selected to represent GB at the 43rd European Junior Championships in Hódmez?vásárhely, Hungary. It was a fantastic learning experience for me to be racing against the best junior swimmers in Europe at arguably the fastest junior swim meets in the world.For me, the standard of competition had never been higher and I couldn’t wait to start racing. On the first day our 4x100m Freestyle team qualified 7th for the final, with only 3 seconds separating first and last our team only managed to equal our qualifying time having being pushed into 8th by a strong Spanish team. I split 50.8 but regardless of the result I couldn’t have been prouder and this enjoyment continued throughout my 3 individual events that week.I managed to make a semi-final in the 200m Freestyle and take my starting position of 16th down to 12th. The atmosphere in the venue during semi-finals and finals was like nothing I had experienced before with teams like Russia and Poland going crazy in the stands. 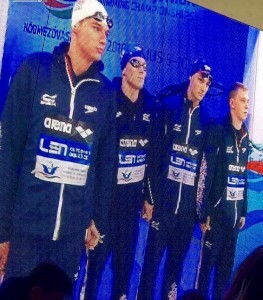 It was a pleasure to swim alongside such a talented GB Team with some breaking British records and taking home medals. The team camaraderie was by far the best of all the countries and I made some great friends during my time there.GB finished with a total of 5 Gold, 4 Silver and 10 Bronze on the medal table after tying with Russia for some time before being beaten into 3rd by a strong Italian performance on the last night. I hope to put to good use the added experience I have gained from this tough competition in the up coming Nationals in 2 weeks. It has been very pleasing to see our swimmers compete on International teams – we have a proud record of Internationals here at City of Salford SC and this would not be possible without Salford Community Leisure, the City of Salford Swimming Club and the great work done by the coaching staff. We are very proud that we have again produced another GB swimmer. It is strong testimony to the superb work done by our coaching set up in Salford that we continue to produce athletes who compete at the highest levels and represent their country. Lewis follows in the footsteps of Luke Wood, James Doolan, Heather Frederiksen and Danny Phillips who were all selected to the GB Junior Team.